A personal blog about Ultimate Frisbee as seen by a rookie handler and an introvert. Introverted Ultimate is a personal blog about world's best kept secret - Ultimate Frisbee. It's a dynamic team sport, which gains more and more recognition across the world. Ultimate has a passionate and dedicated community of amateur and pro sportspeople. The blog shows an introvert's perspective on the sport and it's addicting nature. 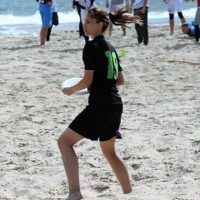 Check out blog post in categories: Ultimate Frisbee, Tournaments, Interviews and Introvert's Musings. Check out the latest blog posts on Introverted Ultimate. You have nothing to loose! Hi! I'm Oli. I've been playing Ultimate Frisbee for 3 years at Ultimatum Gdańsk. If you want to learn more check out the About Me section. Marvel addict, bookworm, bass player, enjoys writing, occasionally quotes Shakespeare.